In 1968 another Exception single titled 'Helicopter' had been issued so no time was wasted in selecting John's replacement. Following a recommendation from Dave Pegg, bass guitarist Malcolm Garner joined in September 1968 by which time the band had relocated to London. Malcolm had previously played in Brum bands The Andicaps and the Jasper Stubbs Gloryland Band. Saxophone player Steve Yetson also joined the line-up to help fill out the sound on-stage. Malcolm recalls; "We lived at the Madison Hotel, Sussex Gardens in Paddington. From there we undertook two extensive tours of Germany including West Berlin which was a big deal in those days." The German tours left lasting memories for Malcolm Garner; "At a gig in Lansdberg near Munich, we were contacted by members of the Landsberg Blues Club who wanted lots of blues so we obliged. Gigs in West Berlin were memorable because of the trip through the GDR and hassles with Soviet soldiers. We were scared stiff when we went to East Berlin via 'Checkpoint Charlie' and the Soviets wouldn't let us return to West Berlin!" Despite recording and releasing more Alan Eastwood composed singles including the excellent 'Jack Rabbit', chart success still eluded the band. Alan also had his own solo single issued on President in mid 1968 titled 'Blackbird Charlie'. In light of this it seems strange then that Eddie Kassner had The Exception record an entire album that was released early in 1969. 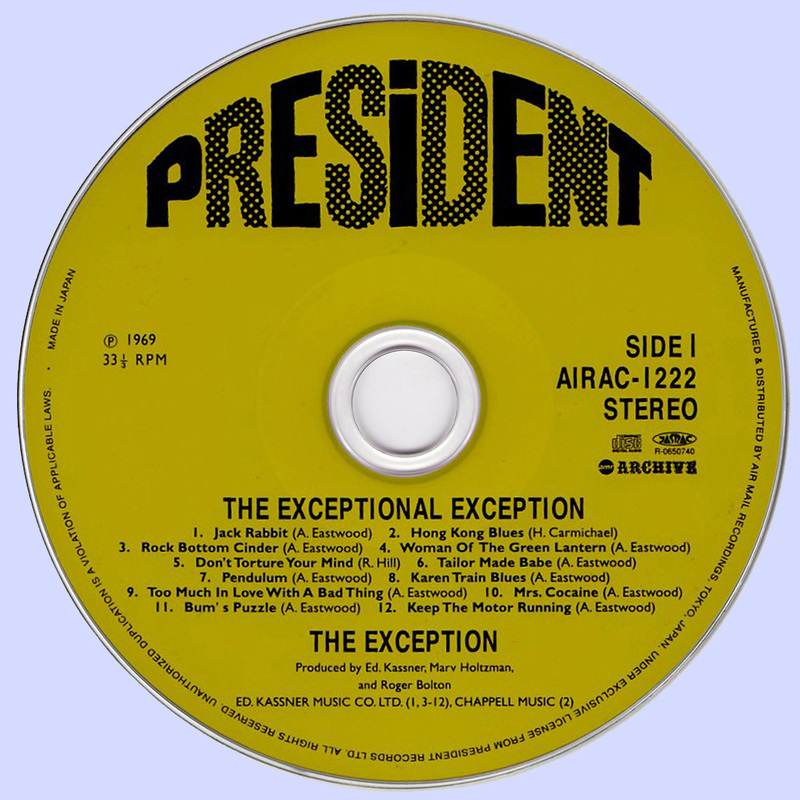 The LP titled 'The Exceptional Exception' was filled with Alan Eastwood compositions, most of which seemed lyrically biographical and some such as 'Woman Of The Green Lantern' and 'Mrs. Cocaine' reflecting a darker side of his imagination or experience. The sole "exception" was Roger Hill's psychedelic-styled 'Don't Torture Your Mind' that seemed to echo a trend now past. Alan "Bugsy" Eastwood left The Exception shortly after the album's release. Roger Hill took over on lead vocal and another drummer was enlisted for yet another German tour. The revised line-up was well-received on the tour but it wasn't the same anymore. 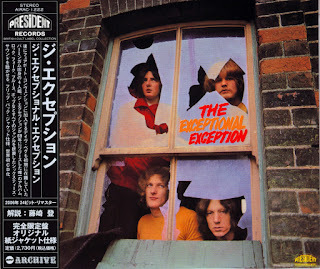 In retrospect, it seems The Exception experienced their greatest success as an energetic blues/R&B act - something their record company failed to capitalize on and instead issued singles aimed towards a pop audience. Malcolm says; "We found another drummer but of course he was no replacement for Bugsy and the band split in May 1969. That's when I went to Germany with my German fiancee Ulrike, learned the lingo and stayed". Roger Hill was enlisted by former Move front-man Carl Wayne to join his new backing group known as 'Mongrel' but tours proposed for the line-up never materialized. Roy Wood later recruited most of the band to form his own chart-topping 'Wizzard'. Roger then re-joined his former band-mate Dave Pegg as part of the Fairport Convention line-up for a tour of the U.S.A. He later embarked on a long career as a jazz guitarist to which his talent was well suited. In later years, he formed his own 'Roger Hill Band' with whom he performed around the Birmingham area. Roger Hill passed away at age 66 in November 2011, Alan Eastwood continued to work in the music business and spent his later years in London where he lived until his death from heart failure on October 25, 2007. All song by Alan "Bugsy" Eastwood except where noted.